As Democrats eye a potential pick up in Louisiana’s gubernatorial run-off election later this month, the party is hoping it can salvage one race this year after historic losses in Mississippi and Kentucky and generally reeling from what is shaping up to be the worst electoral decade ever for Democrats in races for governor. 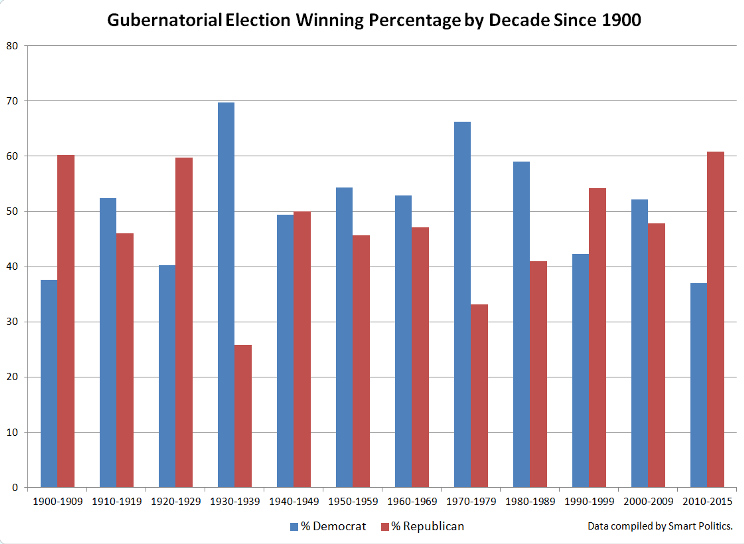 A Smart Politics analysis of the nearly 1,900 gubernatorial elections conducted since 1900 finds that the Democratic winning percentage in the 2010s – 37 percent – is lower than in any decade since the turn of the 20th Century. Democrats have won just 34 of 92 gubernatorial elections since 2010, or 37.0 percent, with Republicans winning 56 races (60.9 percent) and independents claiming victory twice in Rhode Island (2010) and Alaska (2014). That is the worst electoral rate for the Democratic Party since the beginning of the 20th Century. Democrats peaked by this measure during the 1930s, winning 127 of 182 races for governor, or 69.8 percent. The party later eclipsed the 60 percent mark in the 1970s (winning 100 of 151 contests, 66.2 percent). Democrats also won a majority of gubernatorial elections in the 1910s (99 of 189, 52.4 percent), 1950s (95 of 175, 54.3 percent), 1960s (82 of 155, 52.9 percent), 1980s (72 of 122, 59.0 percent), and 2000s (61 of 117, 52.1 percent). The Democratic electoral drought of the 2010s most closely resembles that of the 1900s, when the party won just 68 of 181 elections, or 37.6 percent. Democrats also failed to win a majority of elections in the 1920s (74 of 184, 40.2 percent), 1940s (87 of 176, 49.4 percent), and 1990s (61 of 144, 42.4 percent). But not only are Democrats losing gubernatorial elections at a rate not seen in more than a century, they are losing badly. Alabama (2014): Former Democrat-turned-Republican Congressman Parker Griffith won 36.2 percent – the worst showing for a Democratic gubernatorial nominee in the state over the last 46 cycles since 1865 when nominee Michael Bulger won 35.9 percent. Alaska (2014): The 2014 cycle marked the first time in state history out of 15 elections that Democrats did not field a candidate on the general election ballot. Primary winner Byron Mallot instead joined independent candidate Bill Walker as his running mate, knocking off GOP incumbent Sean Parnell. Arizona (2014): The 41.6 percent won by Fred DuVal marked the fifth lowest support for a Democratic nominee out of 42 elections since statehood behind ahead of only Joe Haldiman (1952, 39.8 percent), Lee Ackerman (1960, 40.7 percent), Carolyn Warner (1986, 34.5 percent), and Paul Johnson (1998, 35.5 percent). Arkansas (2014): Former Congressman Mike Ross’ 41.5 percent marked the second worst showing for a Democrat out of the 73 elections in which the party has fielded a nominee since statehood in 1836. (Besting only Bill Bristow’s 38.7 percent in 1998 against Mike Huckabee). Iowa (2014): The 37.3 percent recorded by Jack Hatch against Governor Terry Branstad was the lowest support for a Democratic nominee over the last 26 cycles. Not since former Governor Nelson Kraschel’s 37.0 percent in 1942 have Iowans given such tepid backing of a Democratic candidate for governor. Kentucky (2015): Jack Conway’s 43.8 percent was the worst showing for a Democratic nominee over the last 40 election cycles since 1863 when Charles Wickliffe won 20.4 percent. Conway’s support was the third lowest in party history across the 49 election cycles since Democrats first fielded a nominee in 1832. Maryland (2014): Lieutenant Governor Anthony Brown’s 47.3 percent was the worst Democratic showing since 1966 when George Mahoney garnered only 40.6 percent. It was also the fifth lowest turnout for a Democratic nominee in the state out of 39 gubernatorial elections conducted in Maryland since the Civil War. Mississippi (2015): Political novice Robert Gray won 32.1 percent against Governor Phil Bryant – the lowest mark for a Democratic nominee in party history across the 49 cycles in which Mississippi Democrats have officially fielded a candidate for the office since 1833. Nevada (2014): Bob Goodman’s 46.7-point loss to Governor Brian Sandoval was the largest ever suffered by a Democratic nominee in the 39 gubernatorial contests in Nevada history. Goodman’s 23.9 percent was the fourth lowest in party history. New Jersey (2013): State Senator Barbara Buono won only 38.2 percent of the vote against Governor Chris Christie for the second lowest support registered by a Democrat nominee since direct elections for the office began in the state in 1844. Only Assemblyman Peter Shapiro’s 29.3 percent against Governor Tom Kean in 1985 was lower in New Jersey’s 52 gubernatorial races. New Mexico (2014): The 14.4-point loss by Attorney General Gary King to Governor Susana Martinez was the largest deficit in party history for New Mexico Democrats. King’s 42.8 percent was also the second lowest mark for a Democrat across the 40 gubernatorial races since statehood ahead of only his father’s 39.9 percent performance during the Republican revolution of 1994. North Carolina (2012): Lieutenant Governor Walter Dalton’s 43.2 percent was the lowest mark for a Democratic gubernatorial nominee since 1840. The only Democrat to fare worse was former governor and Congressman John Branch who won 35.6 percent in the state’s second direct election for the office in 1838. Ohio (2014): Ed Fitzgerald’s 33.0 percent against Governor John Kasich was the second poorest Democratic gubernatorial performance across the 79 elections the party has fielded a nominee since its first candidate appeared on the ballot in 1830. Only State Senator Robert Burch’s 25.0 percent in 1994 was worse. South Carolina (2014): At 41.1 percent against Governor Nikki Haley, State Senator Vincent Sheheen received the second lowest level of support for a Democratic nominee over the 50 races in which the party has fielded a nominee in a direct election in state history dating back to 1868. Sheheen ranks only above State Senator Theo Mitchell’s 27.9 percent in 1990 against Governor Carroll Campbell. South Dakota (2014): In the Mount Rushmore State, where Democrats are in the midst of their longest gubernatorial drought in the nation at 10 in a row, State Representative Susan Wismer won only 25.4 percent of the vote – the poorest showing for a Democratic nominee over the last 35 cycles since William Bulow’s 22.9 percent in 1924. Tennessee (2014): Charlie Brown won only 22.4 percent against Governor Bill Haslam – the lowest support ever received by a Democratic nominee across the 71 cycles in which the party has fielded a nominee since 1833. Texas (2014): State Senator Wendy Davis won 38.9 percent – fourth lowest in Democratic history across the 69 cycles with a Democrat on the ballot in state history (besting only nominees in 1853, 1998, and 2006). Utah (2012): Peter Cooke’s 27.6 percent was the fourth worst showing by a Utah Democratic nominee across the 31 gubernatorial elections conducted since statehood behind. In fact, the five cycles with the lowest voter support for Democratic nominees have all occurred in the last quarter-century: in 1992 (Nick Hanson, 23.2 percent), 1996 (23.3 percent), 2008 (Bob Springmeyer, 19.7 percent), 2010 (Peter Corroon, 31.9 percent), and 2012 (Peter Cooke, 27.6 percent). Wyoming (2014): The last two Democratic nominees have recorded the two worst performances over the 36 gubernatorial elections conducted in Cowboy State history. The 27.3 percent won by Pete Gosar in 2014 against Governor Matt Mead only ranks above 2010 nominee Leslie Petersen’s 22.9 percent when Mead won his first term. As a result of the Democratic demise in gubernatorial races this decade, Republicans are in turn enjoying their best record of electoral success since the turn of the 20th Century. The 60.9 percent GOP victory rate in races for governor slightly edges the 60.2 percent rate the GOP notched during the first decade of the 1900s.